The chunky shape, cocked tail, and thin bill look good for a wren of some kind. The strong rusty color is all wrong for House, Winter, Rock, and Sedge Wrens, and the supercillium looks too prominent for the first three species. Sedge Wren would also be more streaked above. A Bewick's Wren would have a longer, gnatcatcher-like tail. The rusty color looks good for a Carolina Wren but the thick dark barring on the wings isn't found on Carolina Wren. The thick wing barring is however a characteristic of Marsh Wren. 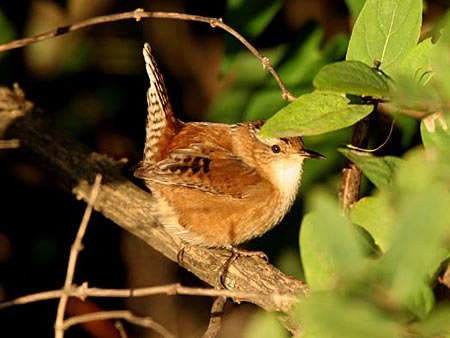 This Marsh Wren was photographed at Montrose Point in Chicago on September 19, 2006 by Kanae Hirabayashi.